You are here: Home » Problems accessing internet in some corners of the home? Try plugging this in! Problems accessing internet in some corners of the home? Try plugging this in! The question of extending the home network has come up a few times lately. What are your options for extending your network if you don’t have a network point in every room? Is wireless the answer? That all too often taken for granted ability to always be connected to wi-fi as you walk around your house with your laptop or mobile device? Unfortunately sometimes there is a corner where you would like to work or need connectivity and for some reason the wi-fi is always poor or none existent. That room at the end of the house, or top or bottom where coverage of your wireless network is just bad no matter where you place the wireless router. When I converted my attic the new foil back slabbing and insulation that surrounded it basically meant wireless was none existent up there while perfect in the rest of the house. This was where I hoped to have a computer desk for doing some work from home. Moving the router wasn’t really an option from its current location besides it worked well for the rest of the house. I tried a repeater upstairs, a way of extending the wireless network but that also failed to get wireless into the attic. Trying to retrospectively include network cabling would be expensive and awkward (Yes if I ever build my own house I will have it cabled properly… if…). I needed to get a network point into the converted attic but running a cable to the router on the ground floor was next to impossible. I had read a number of times about ethernet over power but had never seen it in action (basically where you use your home electrical wiring to extend your computer network). I started researching and discussing with a few people and by chance a colleague was using it in his apartment. He loved it. 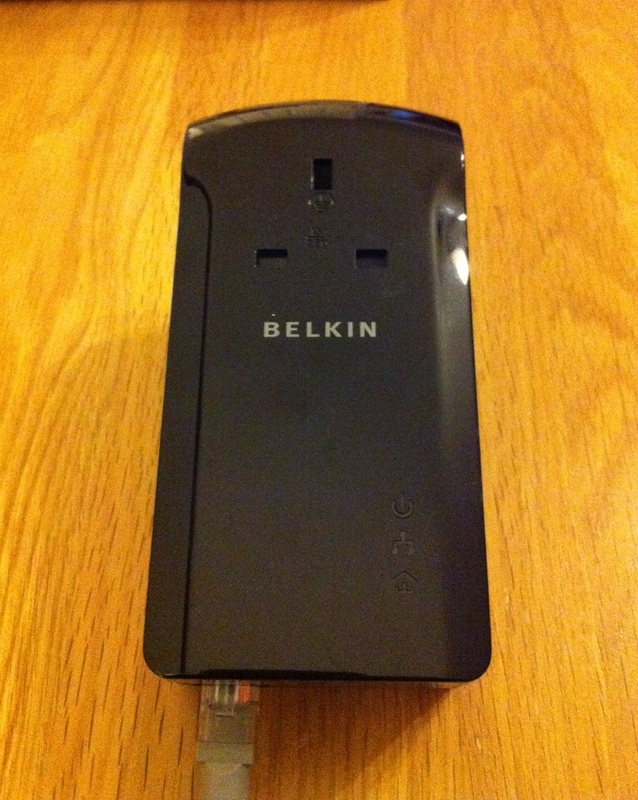 On to the web I went and found the Belkin Surf Powerline 200Mbs with passthrough as in the pictures(You can get a 1Gb if you wish). Passthrough is a simple but nice feature as I don’t lose the socket and I can I plug any device into the front of this piece of equipment for power. I am not sure if you can buy as a single device but anyhow at the start you need at minimum two. One is plugged into your internet router, this basically makes your home electrical wiring one large network. 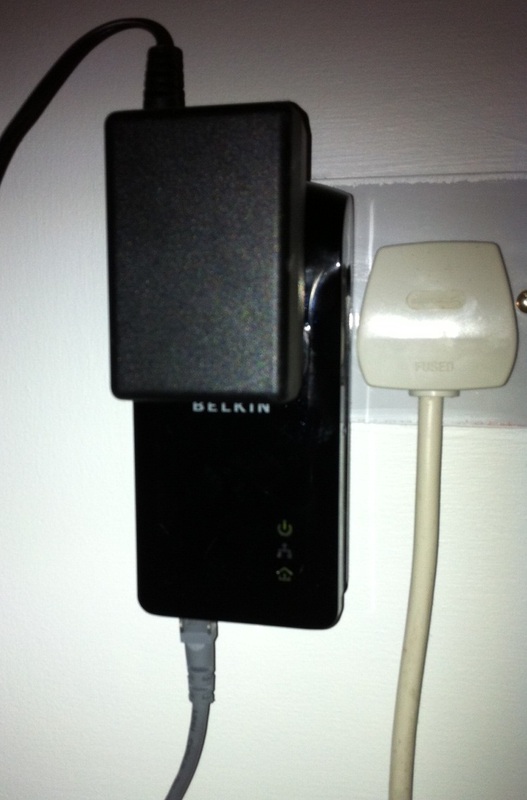 The other device can then be plugged in anywhere around the house into a power point to provide a network connection. No setup required. They just worked from the moment I plugged them in. I now had an excellent network connection right into the attic and all I had to do was plug them in. Yes it was that simple. I connected the network cable from the Belkin to my laptop in the attic and I had a perfect connection to the internet. You could obviously add a little hub for more ports or another wireless router which would really extend the reach of your network. It worked so well that I bought two more a couple of months later and connected up my Sky TV and a network drive(I connected up the Sky TV as it streams video so I wanted a better connection than wireless). As I already had one plugged into the router it meant these two new ones could be plugged in anywhere around the house giving me in total three ‘floating’ network points. As from the pic the units are a little big and if like me you plug an adapter into the passthrough on the Belkin then it does make it a little bulky. It’s not exactly something that can sit in your hallway and probably best for a corner. However I do really like the solution. The cost was only about €100 euro and a supremely easy piece of tech to use and set up. You just plug it in! When you consider the alternative of trying to run a cable around the house and how messy or unsightly the end result might be this wins hands down. There is one small condition (well possibly pretty large depending on where you want to use it!) but this will only work across a single fuse board. As in if you want to use them in any part of your house or garage that has a different fuse board to where your unit and router is plugged in it wont work as that is essentially a different circuit. They must be on the same circuit! That aside I love it and it is a clever piece of tech that allow us to expand our connections without needing a degree in ‘Unnecessarily Complex Setup Manuals’ and spending hours in trying configure it. It provides a smart solution for an everyday problem. I am using it now for quite a few months and they just always work. Top marks! ← Monitors. Two are better than one. Yes they are! Hello I in the vein of your wewebsite. Perform you need to visitor publish in my peculiar by the side of approximately point? They are also very cgeap to instaol andd use less vitaliy than refriberative air conditioners.